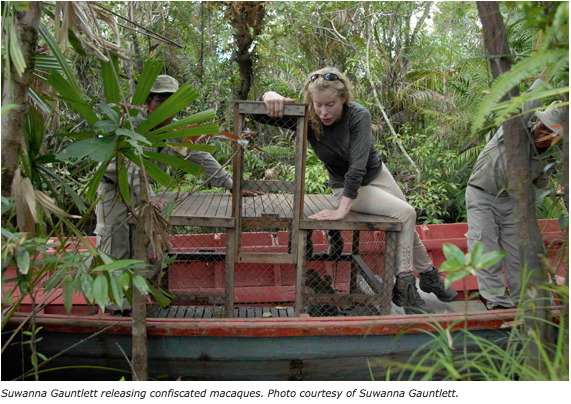 Suwanna Gauntlett has dedicated her life to protecting rainforests and wildlife in some of the world’s most hostile and rugged environments and has set the trend of a new generation of direct action conservationists. She has designed, implemented, and supported bold, front-line conservation programs to save endangered wildlife populations from the brink of extinction, including saving the Amur Tiger (also known as the Siberian Tiger) from extinction in the 1990s in the Russian Far East, when only about 80 individuals remained and reversing the drastic decline of Olive Ridley sea turtles along the coast of Orissa, India in the 1990s, when annual nestings had declined from 600,000 to a mere 8,130. When she first arrived in Cambodia in the late 1990s, its forests were silent. "You couldn’t hear any birds, you couldn’t hear any wildlife and you could hardly see any signs of wildlife because of the destruction," Gauntlett said. Wildlife was being sold everywhere, in restaurants, on the street, and even her local beauty parlor had a bear. In fact, Cambodia has long been one of Asia’s five main source countries for wildlife exported for traditional Asian medicine, exotic pets, and meats. While laws protecting species and prohibiting their sale were on the books, they were never enforced. But that’s changing. In just 10 years, Suwanna and Wildlife Alliance has worked hard with Cambodia’s Government to reduce the illegal wildlife trade—with great success. As Suwanna says in this interview, "We’ve repressed the wildlife trade by 70 percent. [Now] like in prohibition time [in the US] when people had to go into closed bars, they have to hide to eat wildlife." 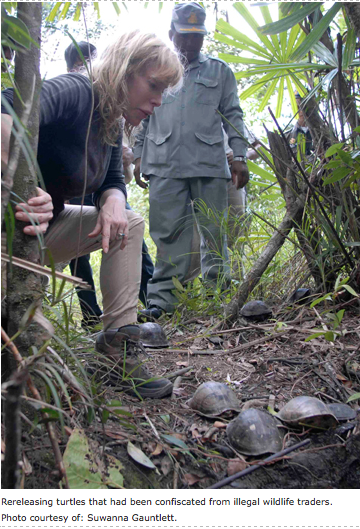 Her work with Wildlife Alliance also focuses on protecting habitats in Cambodia and elsewhere. Suwanna likens Cambodia’s challenges to the movie Avatar, and notes that the biggest threat to wildlife is clear-cutting of its tropical forest for commerce. The stories are similar around the world. In Brazil, for example, forests are cleared for soya and livestock; in Indonesia, it’s for palm oil and rubber. This reality has prompted Suwanna and Wildlife Alliance to focus on fighting these forest conversions and instead providing alternative and more diversified and sustainable means of making a living. Already, she and Wildlife Alliance have helped convince the government to avoid 28 economic land concessions and saved over 2 million acres of forestland. 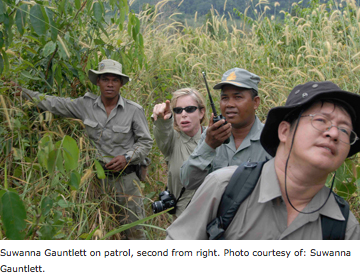 One of those that Suwanna discusses in this interview focus on her efforts in the southern Cardamom mountain range, one of Asia's last seven elephant corridors and Cambodia's largest remaining intact forest. The Cardamom Mountains are a unique landscape. 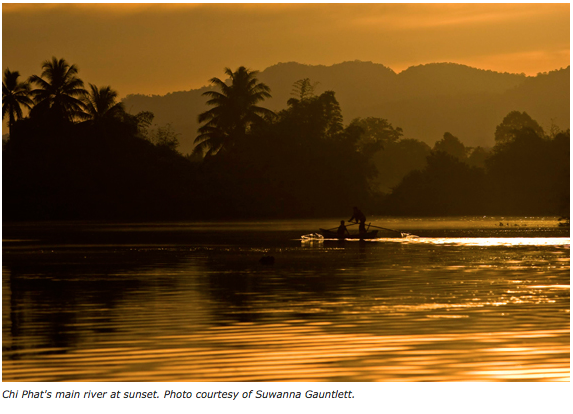 It's the largest watershed in region, with 20 major waterways that feed 3,800 villages in over 6 provinces. Already, her program has reduced elephant poaching there by 95 percent, tiger poaching by 50 percent and forest fires by 80 percent. However, those successes are under constant threat from proposed land concessions. For instance, a titanium mine was recently planned in the heart of an elephant corridor in the Cardamom Mountains. And now a proposed banana plantation threatens to sever the corridor if it is allowed to move ahead. The following is an excerpt from The WildLife with Laurel Neme, a program that probes the mysteries of the animal world through interviews with scientists and other wildlife investigators. The WildLife airs every Monday from 1-2 pm Eastern Standard Time on WOMM-LP, 105.9 FM in Burlington, Vermont. You can livestream it at www.theradiator.org or download the podcast from iTunes, www.laurelneme.com, or http://laurelneme.podbean.com. This interview originally aired March 21, 2011. Laurel Neme: What was the wildlife situation when you arrived in Cambodia in 2000? Suwanna Gauntlett: There was a massive genocide of animals that were being exported to neighboring countries, used in restaurants or for pets inside the country. … When I arrived in Cambodia in 2000 I was appalled because I saw wildlife trade everywhere. Wild animals being sold in markets, in people‘s home, on the sidewalks, in restaurants. You'd go to the bathroom, and you would see turtles and pangolins in nets waiting to be boiled. On the roof, there would be long-tailed macaques, which are monkeys, waiting for their brains to be eaten alive. In the back of restaurants, you would see bears waiting for their next paw to be cut off to be eaten after golf tournaments as a delicacy. You’d be invited to a general's home and he'd have tigers and bears in his garden in tiny cages. I remember there was a beauty parlor where young ladies use to go, and I used to buy some beauty products there, and upstairs there was a bear in a cage in the hallway. Laurel Neme: For what purpose? Suwanna Gauntlett: It is a completely different mentality. If you have a powerful wild animal, it's a sign of status—it means you are more powerful than that animal and it means you have money. Showing your friends a tiger or a bear in a cage means that you’ve really made it and you're high up and you have high status. Laurel Neme: What did you do about it? Suwanna Gauntlett: I worked with Cambodia’s Forestry Administration, who was very willing to take a stance on this. Cambodia already had a law [prohibiting wildlife trade], but it wasn't being enforced. I helped them create the first brigade [called the Wildlife Rapid Rescue Team or WRRT] in Southeast Asia on law enforcement with the Forestry Administration and military police to go around the country and crack down on all the illegal wildlife trade, such as shipments to neighboring countries, in restaurants and at markets. We [WRRT] would do undercover investigations, inspections and crackdowns. We cracked down on thousands of restaurants. I was lucky enough to have the Prime Minister on board, who gave orders to all the law enforcement agencies to stop the wildlife trade. The mayor of Phnom Penh created new regulations and talked about it every morning on his five-minute radio show, threatening to close restaurants if they didn’t stop selling wildlife. And he followed up and closed the biggest restaurant in town. Laurel Neme: What's been the result? Suwanna Gauntlett: Today you will not find in Phnom Penh wildlife for sale, at least not visibly. You can sometimes order it if you call in advance, but it’s not on menus—everybody knows it is illegal. Laurel Neme: How long did it take to change things? Suwanna Gauntlett: We did it in a couple of years. Of course, one brigade is not enough to stop the entire illegal wildlife trade crossing the borders but it sets the pace, gives the message, and shows that the government is serious in enforcing the laws. Laurel Neme: How big is the Wildlife Rapid Rescue Team (WRRT) and what factors led to its success? Suwanna Gauntlett: Having support from a high level was very important. The brigade is 14 men—four foresters, 10 military police and 1 Wildlife Alliance advisor that goes on patrols with the team. Formally, Wildlife Alliance is the project manager of this brigade, which is called the Wildlife Rapid Rescue Team. Laurel Neme: What areas of the country does it cover? 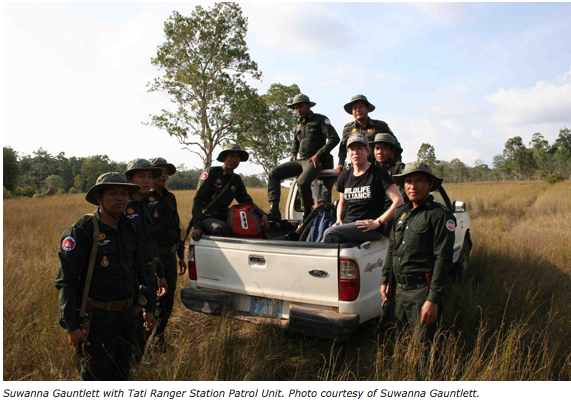 Suwanna Gauntlett: The Wildlife Rapid Rescue Team focuses on the whole country. In 2005 or 2006, we received support from the US government because of our great success in Phnom Penh and they asked if we could replicate it in five other cities—so we did through a combination of education and law enforcement. But the brigade is working throughout Cambodia's 23 provinces. Laurel Neme: That's a huge amount of land to cover for 14 people. Suwanna Gauntlett: It is. Sometimes they have to break up into three groups. We have a lot of people calling and saying, "We would like to donate the bear that we have. We realize that it was not a good idea to keep this bear in the cage." So the team is really split very thin. Unfortunately, this is the only brigade that exists and it’s already expensive to operate. Laurel Neme: What are some of the species you’re seeing in the trade? Are you seeing a lot of pangolins being trafficked? Suwanna Gauntlett: By and large, the charismatic species are going to extinction, so they aren't available in the forest anymore. Therefore, the traders are focusing on less charismatic species, which is now pangolins. Pangolins are now worth something like $200 per kilogram, when they used to be $45 per kilogram, and 10 years ago they used to be $5 per kilogram. [Consequently,] they’re becoming more and more rare. Pangolin is now an endangered species. Slow lorises, we can hardly find any more. Long-tailed macaques are being sold for laboratories in Vietnam. So you have the more common species being trafficked. Laurel Neme: How is the Wildlife Rapid Rescue Team funded? Suwanna Gauntlett: The Wildlife Rapid Rescue Team is funded through a variety of organizations, including Sea World-Busch Gardens, Disney, and some private donors. This year we were funded by CEPF, which is the Critical Ecosystem Partnership Fund. Unfortunately that fund closes formally this year. Laurel Neme: What kind of success has the Wildlife Rapid Rescue Team had in stopping illegal trade? Suwanna Gauntlett: We have suppressed wildlife trade by 70 percent. It’s pretty similar to prohibition time in the United States, in Chicago, when people had to go into closed bars to drink. Here you have to really hide to eat wildlife. It’s still happening. The main endangered species, such as tigers and elephants, are no longer hunted because tigers mostly are extinct. They’re gone because of the wildlife trade. Elephants are extremely protected, and if you want to sell an elephant, you could hardly do it in a hidden fashion, it is too visible. So that is not happening. However, smaller species such as sun bears and pangolins are still being sold. I would say that we are deterring the wildlife trade nationally and probably at the 70 percent level. By the way, the mobile unit, the WRRT, has confiscated over 40,000 live animals over the last nine years as well as five metric tons of meats, seven metric tons of body parts and specimens. So, a huge amount of wildlife has been confiscated. And I think something like 637 traders have been arrested. Laurel Neme: What happens once they’re arrested? Are they paying fines? Going to jail? Suwanna Gauntlett: It depends on the law. If it's an endangered species they are transporting, they face five to ten years in prison. If it is a common species, they will be paying three times the value of this animal on the market, and their car [used to transport the wildlife] is confiscated. The vehicle will only be returned if they pay the penalty. Of course, the wildlife is never returned. If the animals are still alive and in good shape, they are kept to be rehydrated and fed for 48 hours and then released back into their natural habitat, in an area that is protected properly. And if not, if they are wounded, they have to go to the rescue center until they are able to be returned to the wild. Laurel Neme: Much of your work is also related to the forest. What are some of the threats to the forest in Cambodia and elsewhere in Southeast Asia? Suwanna Gauntlett: The forest in Cambodia is part of the tropical belt—we’re in the same tropical climate and biodiversity [zone] as Brazil, Indonesia, Thailand, Myanmar, and Vietnam. Technically, Cambodia is in the Indo-Burmese Peninsula. We are helping protect one of the world's 34 biodiversity hotspots, which is the Cardamom Mountain Range, [which is] the largest remaining rainforest in Southeast Asia. It is also one of only seven remain elephant corridors in Asia. Laurel Neme: Why are the forests in Cambodia, and the Cardamom Mountains in particular, threatened? Suwanna Gauntlett: Because of economic interests. Most of the forests in Asia have been fragmented, which means you have islands of forests and then you have great spaces of development and another island of forest. Large species, such as elephants and tigers, need continuous forest cover and a continuous range in order to reproduce and find enough food. Their species will be extinct if they are not able to move across large ranges of forest cover. The biggest threat in Cambodia [and in other countries like Brazil] is conversion of tropical forest to large-scale agriculture. In Brazil it is for soya bean, predominantly, and livestock. In Indonesia, it is everything from palm oil to rubber to other types of high-yield crops. In Cambodia, it’s the same thing: it's rubber, it's sugar cane, and it's palm oil. Our challenge has been a little bit similar to [the movie] Avatar: we’re fighting these economic interests from the grassroots level. We’ve been successful so far in avoiding 28 economic land concessions—thus avoiding conversions of 607,000 hectares, which amounts to almost 2 million acres [of forest saved]. Laurel Neme: What is a typical economic land concession in Cambodia? Suwanna Gauntlett: An economic land concession is a permit from the government that allows a large company such as agro-industry, palm oil, sugar cane or rubber to clear cut the forest, to bulldoze all the trees away and plant a commercial plantation instead. These permits cover thousands of hectares—typically 20,000-30,000 hectares—and you multiply that by 2.3 for acres. So, that’s almost 100,000 acres right there. Sometimes the economic land concessions are for mining or hydro power. Laurel Neme: How do you fight economic land concessions? Suwanna Gauntlett: We fight them on two fronts. Sometimes economic land concessions are legitimate and they're from the government, and sometimes they aren't. The smaller cases will be maybe a military [official] in a high position trying to grab land in state forest, [and he obtains] some kind of [bogus] permit from a local governor or district governor which bears no legal weight whatsoever, but he tries to bully his way in and intimidates villagers and law enforcement officers and starts clearing with his own bulldozer. If there is no close monitoring, he succeeds and then after the fact, he has his plantation on site and nobody can do anything about it. But mostly, how we stop economic land concessions that are legal is personal interaction, between me and government officials. For all the economic land concessions that have valid permits or are going to have valid permits, I personally interact with the government. I act a little bit like a lawyer. I go on the ground to document GIS [Geographic Information System] points, do GIS mapping, take aerial photographs, and then build the case as to why that economic land concession should not be implemented in that specific location. I then correspond directly with the ministerial level, the Council of Ministers, and sometimes the Prime Minister himself, and follow up with meetings and [additional] correspondence. Sometimes, if it is really necessary, I call upon an inter-ministerial steering committee, that was formed upon our request—I bring them to the site, I brief them and they then go back to central government and represent the case. Laurel Neme: It is an unusual approach in some respects because the government seems so open to hearing these differing viewpoints. Why is that? Suwanna Gauntlett: Let me put this into context. The economic land concession issue is relevant; I think, when an organization like ours, Wildlife Alliance, has been working in an area for several years. We have been assisting the government to implement the Cardamom Protection Program since 2002. It’s a give and take. We’ve helped the government put in place their ranger patrols. We conduct the aerial monitoring. We’ve helped and facilitated the zoning and demarcation of 255 km of forest; we’ve helped zone five communes and urban zones. We’ve been the developers of three communes’ alternative livelihoods, which is sustainable agriculture and ecotourism, to help the farmers stop doing slash-and-burn, which is a very destructive cultivation method that destroys rainforest. So, having seen our partnership yield a lot of positive results, the government is also willing to be forthcoming in helping to continue to protect the area. Laurel Neme: Can you just describe the Cardamom Mountain range? Suwanna Gauntlett: The Cardamoms are a unique landscape. First of all, they are one of the 34 hotspots for biodiversity on the planet. They are the largest watershed in the region. They provide a staggering providing rainfall 3,000 to 4,000 millimeters of rain per year and have 20 major waterways which feed 3,800 villagers and 350 communes over six provinces. The water coming from the Cardamoms feeds the largest lake fishery in Southeast Asia, called Tonle Sap Lake, on the northern side, and it also feeds 155 km of mangrove fisheries in the Gulf of Thailand. It's enormous. That is why the government has chosen that mountain range to produce electricity, and 16 hydropower dams are scheduled. In the area [of the Cardamoms] that we are responsible for, which is the southern portion, we are already working with seven hydropower dam companies to avoid unwanted deforestation. But that is why the rainforest is strategic for the region and for the government. 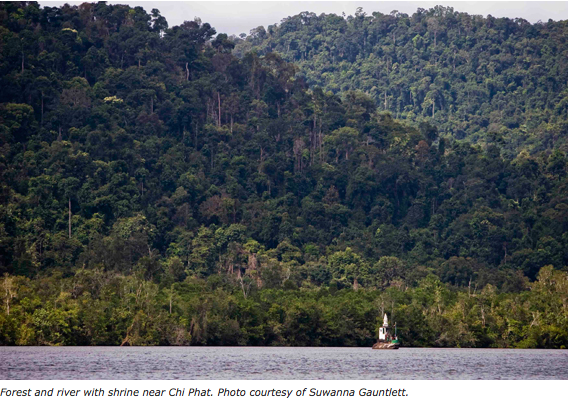 It's the climate regulator and it’s also the only remaining unfragmented rainforest left in Southeast Asia. That’s why it's one of only seven remaining elephant corridors in Asia. Laurel Neme: It's useful not just for elephants but for a lot of species because it's not fragmented and still intact. Suwanna Gauntlett: That’s right, exactly. We have an enormous biodiversity. Just talking about plants, for example, when we did a scientific survey four years ago, we found over 2,000 plants that have no name, that have not been cataloged scientifically in just 4 months. Laurel Neme: How about animals? Suwanna Gauntlett: Most of the charismatic species of the Cardamoms are globally endangered or globally threatened. 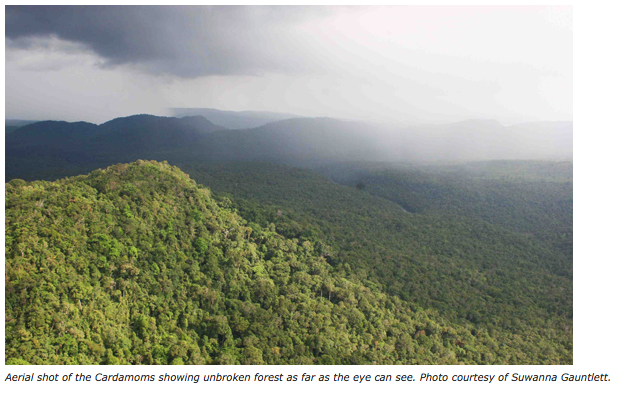 [The Cardamom Mountains are home to more than 74 endangered and vulnerable species and half of Cambodia bird's species.] They range from Asian elephants to Indochinese tigers, Malayan sun bears, Asiatic black bears, southern serow, pangolins, Irrawaddy dolphins, humpback dolphins. It’s an incredible biodiversity. Half of Cambodia’s bird species [are there], including Black-necked storks, Lesser Adjutants, Crested Serpent Eagles, Great Hornbills, and Wreathed Hornbills. It’s beautiful biodiversity: slow lorises, pileated gibbons, and so on. From climatic to water to biodiversity, it is a treasure of the planet and must be preserved. It is pretty much like the Amazon in a smaller version. Laurel Neme: How many people live there? Suwanna Gauntlett: It is mostly unpopulated. But the reason that we are protecting the southern portion and not another portion is because that is the most populated area. When a national highway was built in 2002 to link Cambodia to Thailand, and it gutted through 155 km of rainforest, the government asked us for help because all along the road you had land grabbing for land speculation and forest fires every day. We had 40 forest fires on any given day and 37 elephants and 12 tigers had been poached in just the year preceding the program. It was total anarchy and lawlessness. [Then,] we came in. We helped the government set up on a shoestring some small ranger stations. 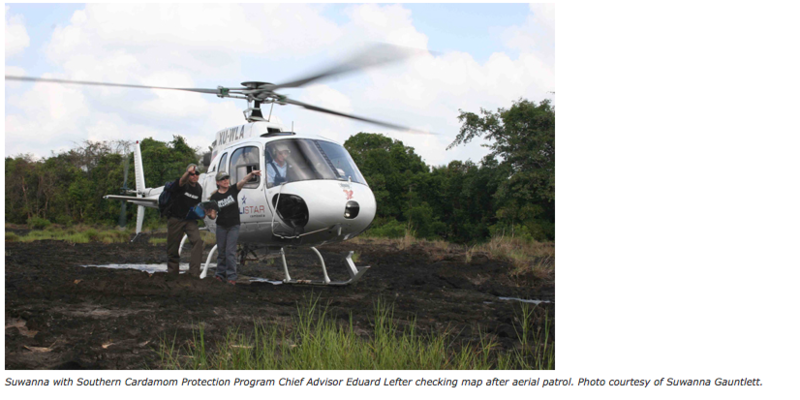 We had a little pot of money to do some aerial surveys, and were able to stop 401 cases of land encroachment in just the first year of operations. We helped the government create an inter-ministerial steering committee to come and put pressure on local government in the province to stop selling state forests under the table, and in one year everything was under control. We reduced forest fires to only 1-4 per week instead of 40 per day, reduced elephant poaching by 98 percent, and tiger poaching by 50 percent. Laurel Neme: Can you describe the ecotourism that’s going on now in Chi Phat [commune/village]? Suwanna Gauntlett: Chi Phat, where we have helped develop ecotourism, used to be the worst community of the whole Cardamoms. When the logging companies left in the 1990s, there was no more opportunity for jobs. So about 280 families went into the forest and started doing slash-and-burn [farming]: burning the forest and just planting rice with sticks. They had absolutely nothing—no buffaloes, no plowing equipment. We called it the circle of destruction. Every year, each family would go further and further into the forest, each cultivating 1.5 hectares per year. Many agencies in the United States think this is sustainable forestry cultivation, but it's not because it is not shifting circular agriculture. Basically you destroy a plot of rainforest. [Then] the rain comes and takes off the topsoil. There is no more fertility. The next year you just clear another plot of the forest. It’s very much like the migrant farmers in the Amazon. 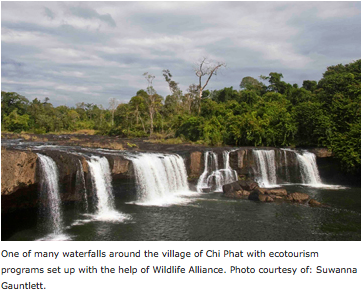 That is why we [Wildlife Alliance’s community ecotourism program] focused on Chi Phat. We were able to help develop sustainable agriculture for 75 families and then after a couple years we found funding to start a seven-year ecotourism process in Chi Phat. Laurel Neme: What is the status now? Suwanna Gauntlett: We're already at the fourth year, and right now ecotourism is supporting 180 families with total cumulated revenue of $66,000 since the official opening for tourism in October 2008 all the way to December of 2010. Now in South East Asia, $66,000 is a lot of money. It's not at all at the same scale as in the US. Families get 80 percent from their own enterprises, which iseither homestays, guesthouses or tour guides. Then, their committee, which is a community committee for ecotourism, keeps 20 percent for equipment maintenance, buying more mountain bikes, more kayaks, more homestays. Currently, there are 60 rooms and we have about 30 tourists coming every day. Laurel Neme: Who are the tourists? Where are they from? Suwanna Gauntlett: The tourists are mostly international tourists. That’s thanks to Wildlife Alliance; we’ve done international marketing in South America, North America, Europe and Australia, and we work with six tour operators. We’ve also reached out to international travel guides such as Lonely Planet, Le Guide du Routard in France and to newspapers. Lonely Planet now is listing the Koh Kong Conservation Corridor, which is the Cardamoms, as one of the world’s top ten destinations. We’re very, very happy to have that. And, from 2008 to 2010, they also listed Chi Phat as the best community-based ecotourism in Cambodia. Laurel Neme: Recently a titanium mine was proposed to be built right in the middle of that. Suwanna Gauntlett: Yes. What we've done is develop the whole of Koh Kong province as an ecotourism destination, and Chi Phat is one of the three main destinations at this point. So the titanium mine would've threatened the survival not only of Chi Phat but also threaten the survival of the tourism throughout the province. Laurel Neme: How would the mine potentially impact the province? Suwanna Gauntlett: It would've turn Chi Phat into an industrial village. It would've ruined the waterways and polluted them. But it would've also meant that these heavy trucks would be travelling through Chi Phat and along the main scenic ecotourism road all day long with huge amounts of rock and making a lot of noise and destroying the landscape. Laurel Neme: Where is the mine located? Suwanna Gauntlett: The proposed titanium mine was located in the middle of the elephant corridor. It’s north of [the community of] Chi Phat; it is right in the middle of a thriving community ecotourism development that we have facilitated over the last four years. Laurel Neme: How big was the proposed development? Suwanna Gauntlett: The area covers 20,400 hectares. It would have been strip-mined for titanium. The titanium is all on the surface. Laurel Neme: What is titanium used for? Suwanna Gauntlett: Titanium is used for airplanes, artificial hips, medical instruments, and golf clubs. It’s a lightweight and very, very hard—almost incompressible—metal. Laurel Neme: Who proposed the mine? Suwanna Gauntlett: [It] was a Cambodian company, and the Ministry of Mines that was sponsoring them. This is what I call a typical case of uncoordinated development whereby there had been no previous information sharing or planning between two different ministries. Unfortunately, this happens in a lot of countries. Laurel Neme: How did you advocate against the mine? Suwanna Gauntlett: What we did is we went about getting theses two ministries to talk to each other and rallied as many different ministries and departments as we possibly could to go on site and see the dense, evergreen rainforest, the elephant corridor, and the ecotourism’s thriving businesses—so as to not destroy everything that had already been accomplished. I personally accompanied two inter-ministerial committees and the deputy prime minister on site, conducting aerial flights, going on the ground trekking, showing them the economic achievements of the community ecotourism, and really building the case for why [what is already there] is sustainable development, but if you bring in the mine and strip-mine everything, it will be unsustainable. Everyone in the village would lose their jobs. Out of 550 families, we’ve been able to build already 360 jobs. The mine said they would offer up to 300 or 500 jobs. Why take away the jobs that already exist to just replace them with one single employer? 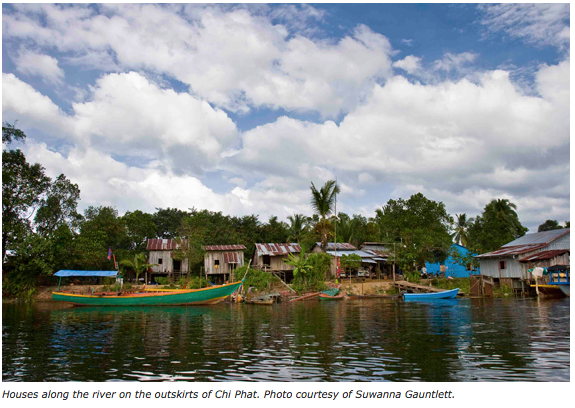 Laurel Neme: What did villagers in Chi Phat and elsewhere think about the mine? Suwanna Gauntlett: Villagers in Chi Phat did not want this mine. They are very happy with the diversified economic approach that we have helped them develop: 75 families doing agriculture creating produce for the ecotourism industry; then we have the ecotourism industry; and we also have a thriving reforestation center for tropical reforestation where tourists can buy a carbon neutral travel plans where they offset their travel CO2 emissions by planting or adopting a swath of forest. Laurel Neme: How did the villagers expressed themselves to the government? What kind of impacts do they have on decisions? Suwanna Gauntlett: How we started, we briefed the villagers, especially the community-based ecotourism committee and the 150 [ecotourism] members—actually it’s 180 families that have businesses, but it’s only officially 150 members—explaining that the mine would take out all the employment options and the small enterprises that they are managing right now. That would be replaced with employment by one single employer: the titanium mine. We also explained to them that jobs would not be guaranteed because it’s mostly specialized heavy equipment drivers and man handlers that would be hired. There is not a lot of digging and moving by individual workers, it’s a lot of heavy equipments. And that their village would be transformed into an industrial hub. Consequently, the four village chiefs of the commune wrote a letter to the Prime Minister requesting that this mine not be implemented, and they went around and obtained over 700 signatures to stop the mine. In parallel to that, I personally organized visits by central government to the site to hear the villagers’ concerns, to see their businesses, and to understand the dilemma between small enterprises and a multi-sector economic approach versus a larger pot of money by a mine but that would reduce the employment pool to only one employer, which is not very sustainable over the long term. Once the mine is finished, the whole natural resource is destroyed and people are left as poor as before because they no longer have a job. Laurel Neme: What was the initial reaction? Suwanna Gauntlett: The [Forestry Administration] and the Ministry of Mines, they're talking to each other. They were both part of an inter-ministerial committees deciding on the issue. [Wildlife Alliance was] invited to actually defend the case of the forest and ecotourism with the company in an inter-ministerial meeting with 17 departments. [Then,] the government informally spoke to the company asking them to reduce the surface [area from 20,400 hectares] to 50 hectares. We made the case that the company did not do any exploration and there was no proof that the quantity of the titanium was enough to make the mine profitable. One of the things that happened during this debate was that the company pretended that the whole mining area was only bare soil and bamboo, and we were able to demonstrate that it was not bare soil and bamboo but [rather] dense, evergreen rainforest. The government saw that the mining company was lying. We kind of nudged them in that direction, saying that we thought this mining company was a cover-up for logging. In February 2011, the Cambodian Prime Minister Hun Sen approved a 20,400 hectare concession to United Khmer Group for this titanium mine. The approval came ahead of a meeting that had been scheduled on February 11, 2011, at the Council for the Development of Cambodia, that was meant to discuss the proposed mining project. In a press release at that time, Suwanna Gauntlett noted that, “Without scientific research to prove the economic viability of the proposed mine, bulldozing the rainforest is simply destructive and does not even make good business sense." In a dramatic turnaround two months later, the Cambodian government reversed its decision. Following a weekly cabinet meeting on April 8, 2011, Prime Minister Hun Sen announced that it would rescind the permit for the titanium mine due to concerns about its impact on the environment, biodiversity and local livelihoods. However, after narrowly stopping this planned titanium mine, the region is again threatened, this time by a proposed Australian-funded industrial banana plantation.